Karttika is a special month to collect lots of mercy and blessings from Bhagavan Sri Krishna. Before citing the super benefits of observing the Karttika Vrata, we will quote Srila Prabhupada’s translation of one verse of Satyavrata Muni’s “Damodarastakam” which is chanted daily in the Karttika month. 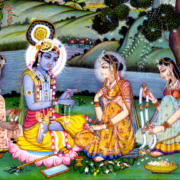 In His teachings to Srila Sanatana Goswamipada (Cc. 2.22), Gauranga Mahaprabhu explained the 64 limbs of devotion by which one can attain the most valuable treasure of love for Krishna (pai Krishna-prema-maha-dhana). 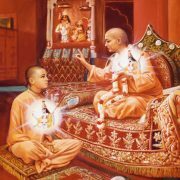 At that time, Mahaprabhu said, “In all respects, one of the most important limbs is to observe special vows in the month of Karttika, (karttika adi vrata, parama-parama-mahattva). In his Nectar of Devotion, Srila Prabhupada said, “One of the most important functions is called Ürja-vrata, observed in the month of Kärttika. The execution of devotional service during Ürja-vrata in the month of Kärttika is especially recommended to be performed at Mathurä. This system is still followed by many devotees. They go to Mathurä or Våndävana and stay there during the month of Kärttika. Srila Prabhupada ki jai! Karttika Super Benefits ki jai!